← LET THE READER BEWARE !! IT IS WITH MUCH MISGIVING THAT I PUBLISH THIS ARTICLE BY ROSS DOUTHAT. IN HIS STRIVING FOR OBJECTIVITY DOUTHAT IS UNCRITICAL OF FRANCIS’ HERESIES AND ASSUMES THE POSTURE OF A NON-BELIEVER WITNESSING A FIGHT BETWEEN CONSERVATIVES AND LIBERALS. HIS IMPARTIALITY RENDERS HIS NARRATIVE DANGEROUS FOR A CONSERVATIVE CATHOLIC WHO ACCEPTS THE NICENE CREED AND THE CATECHISM OF THE CATHOLIC CHURCH AS CLEAR EXPOSITIONS OF WHAT CATHOLICS MUST BELIEVE IN ORDER TO BE FULLY MEMBERS OF THE CHURCH. READ HIS ARTICLE WITH A CRITICAL EYE. Follow Christ!Posted: 30 Sep 2018 05:53 PM PDTOn October 1st, thirty-nine years ago, I was standing on the Boston Common with about 600,000 others. I was a young Episcopal cleric, and a Catholic priest friend of mine had encouraged me to go to Boston “to see the Pope.” It rained for most of the day, and I was standing in it with no umbrella. An excited community of religious sisters was in front of me, screaming their heads off and waving their signs to no one in particular. I didn’t know a single person around me, and after standing in the mud and rain for nearly seven hours, I didn’t think I’d ever want to do this again. But then… the Holy Father arrived. The Mass started. The memory of the long and uncomfortable wait we’d had melted away. I didn’t hear anything but his voice. When he began his sermon, my heart was ready. And when he repeated, “Follow Christ!” that’s all I wanted to do. So I made my decision then and there. I would become a Catholic. I didn’t know how, and I didn’t know when, but to follow Christ meant that I had to become a Catholic. Little did I know at the time that I was in the presence of a saint. I thank God every day that I heard his words, and that the Holy Spirit urged me to respond. Follow Christ. That says it all. Marie Thérèse Martin was born into a family of very faithful Catholics, and she was the youngest of five daughters. Her father was a watchmaker, and her mother, Zelie, who died when Thérèse was four, was a lace maker. While still a child she felt the attraction of the cloister, and at fifteen obtained permission to enter the Carmel of Lisieux, taking the name of Sr. Thérèse of the Child Jesus and the Holy Face. For the next nine years she lived a very ordinary religious life. There are no miracles or exceptional experiences recorded about her. She attained a very high degree of holiness simply by carrying out her ordinary daily duties with perfect faithfulness, having a childlike confidence in God’s providence and merciful love and by being ready to be at the service of others at all times. She also had a great love of the Church and a zeal for the conversion of souls, and she prayed especially for priests. She died of tuberculosis on September 30, 1897, at the age of 24, and was canonized in 1925. She has never ceased to fulfill her promise: “I will pass my heaven in doing good on earth.” Her interior life is known through her autobiography called The Story of a Soul. Pope St. John Paul II declared her to be a Doctor of the Church in 1997. O Lord Jesus Christ, who hast said, except ye become as little children ye shall not enter into the kingdom of heaven: grant us, we beseech thee, in meekness and lowliness of heart to follow the footsteps of blessed Thérèse thy Virgin; and so at last to come unto thine everlasting kingdom; who livest and reignest with the Father in the unity of the Holy Spirit, ever one God, world without end. Amen. 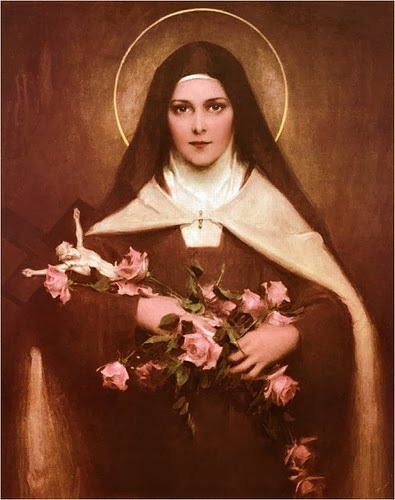 On a personal note, with the Commemoration of St. Thérèse of the Child Jesus – the Little Flower – come remembrances of occasions when she has sent a rose into someone’s life at just the right time. My own experience was several years ago, during a time of great trial, when I very much needed a sign of God’s love and something which would indicate I was acting in accordance with His Divine Will. It was at about 4:45 a.m., when I was walking from my car to offer Mass at the Carmelite convent where I was chaplain. It was a winter morning, and the temperature was near freezing. I had been asking St. Thérèse and the Blessed Mother for their intercession. Just before opening the gate to the convent I looked down, and on the sidewalk was a fresh rose with some drops of water on the petals. When I got inside I asked the nuns if they had been bringing roses in from someplace, but they assured me that they hadn’t. I took it as a sign of God’s love, sent by the Little Flower, and it was all I needed at that important time.